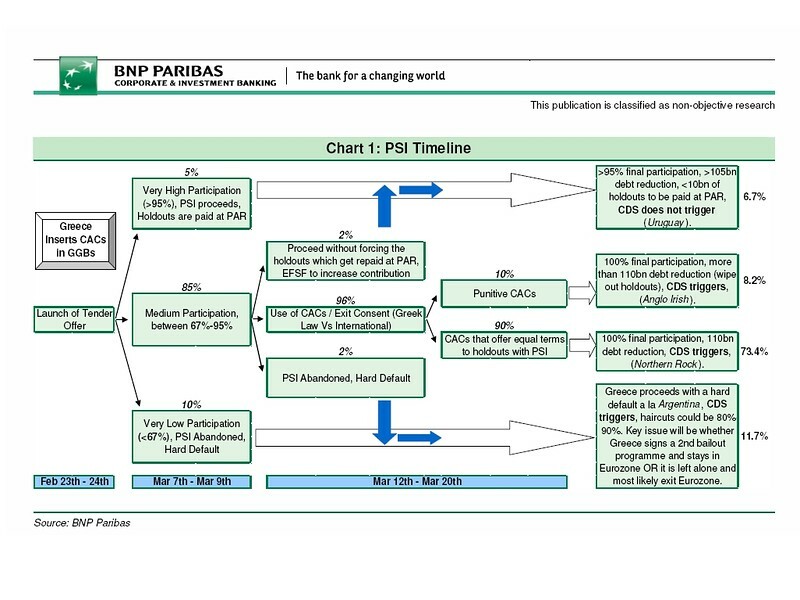 The Wall Street Journal’s Marketbeat blog discusses an interesting flow chart prepared by BNP Â Paribas which shows the various scenarios that could play out following the imminent Greek bond offer to its private bondholders. Among the apparent paradoxes brought out by the chart is that Greece could be better off from a debt reduction perspective if a small majority rather than large majority of bondholders accept the offer, because then it will have the latitude to, er, screw the holdouts, including the possibility of giving them nothing. Whereas with a very high majority, there will be a strong incentive to keep everything consensual and the holdouts escape at par. Anyway, the chart refers to the scenario where Greece is able to impose a punitive scheme on the holdouts as “Anglo Irish.” Â This is because of the bank’s 2010 offering to subordinated debt holders, who were offered new bonds with 20 percent of the face value of the old ones, and by accepting they were voting to impose essentially a complete wipeout of anyone who didn’t accept. FT Alphaville discussed the strategy in detail at the time. It’s a perfectly good label, but if you come away from the chart thinking that Ireland came up with a hardball (or is that “fair shoulder”?) solution to its problem of bank debt, you’d be wrong. That particular offer only dealt with a tiny proportion of Anglo’s overall debt, and it was the easiest target. In fact, far larger public sums have been spent paying at par the legacy unsecured and unguaranteed senior debt in Anglo Irish — claims that would have only residual value had Anglo been allowed to go to the wall as an insolvent bank. Â The closer analogy is with the wheeze that the ECB just pulled to make sure its own holdings of Greek bonds get paid at par, despite having paid heavily discounted market prices for them. So good luck to Greece with the Anglo Irish scenario. It would have been nice had it been tried on any larger scale in Ireland. All the bankers was criminals !